Solar power is an environmentally friendly way to power your home (or RV) while decreasing your electric bill. 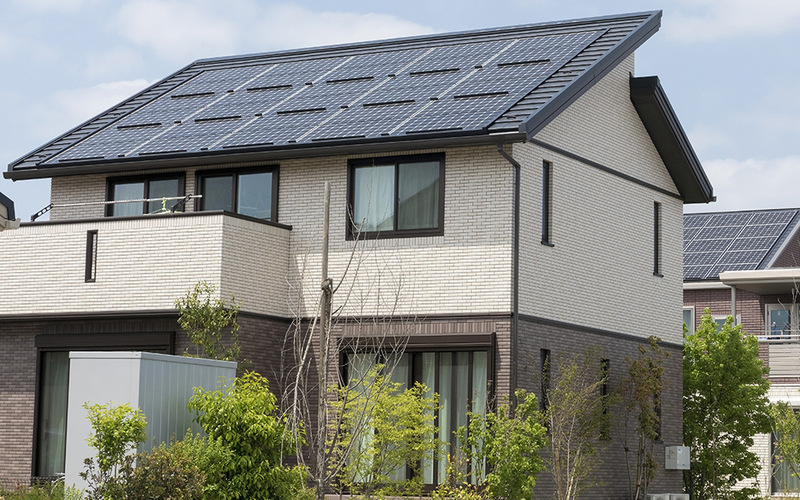 This guide provides an overview of using panels for solar powered homes and highlights their uses, advantages and accessories. Solar power is economical and clean with low maintenance requirements, offsetting what may seem to be prohibitive upfront costs. The long-term savings and long life of solar panels, which can reach 25 years, make them worth the investment. Power from sunlight is clean and infinitely renewable. The panels emit no fumes, have no greenhouse gases or carbon emissions, and are absolutely silent. 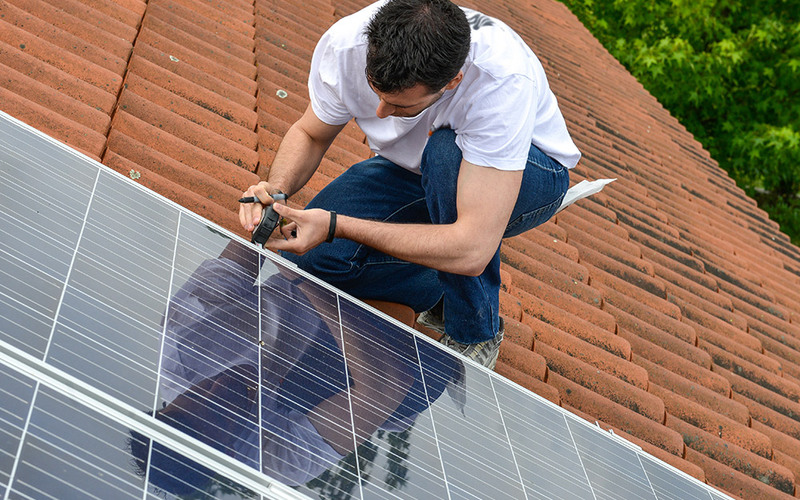 Solar panels for home use are self-sustaining and require almost no maintenance. Grid-tied solar systems reduce your total monthly bill from your electric company at your permanent residence or small business. 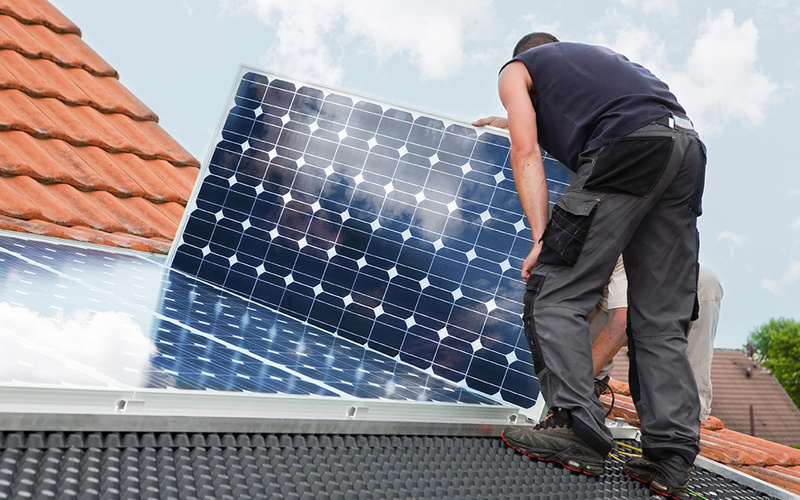 Solar equipment is installed on the roof of the home or business and the panels generate energy that is fed directly to the power company. The power company credits the home or business owner for the energy on their electric bill, or the power fed back into the grid may cause your meter to run backward. Tip: This type of project requires a professional installer, licensed electrician and sometimes can require permits. To see if The Home Depot offers grid-tied solar power installation in your area, check our solar power installation site or call 866-945-9211. Off-grid solar systems provide power to a few devices such as a TV, radio, refrigerator or lights on RVs, boats or at remote locations with no access to electricity. Off-grid solar power set-ups can be installed by a typical DIYer using solar panel kits without the need for a professional electrician. Solar panels are installed on the RV, boat or cabin where they generate energy from the sun. The energy flows from the panels to a charge controller that regulates the amount of energy accepted into a battery. The battery can directly power devices that use DC power, or the power can be converted to AC power for other devices using solar power inverters. There are a few things to consider when deciding how many solar panels are needed to power a house. Identify which devices you want to power using solar energy. Determine how many watts each device uses. Decide how many hours per day you want to run each device. Once you absorb solar energy through your solar panels, you will feed that energy into a battery that will then distribute power to your various devices. You must have a battery with a capacity large enough to handle your total watt hours. Since batteries aren’t always 100 percent efficient, take 80 percent of the ampere hour number we just calculated: 40.8 x 0.80 = 32.6 ampere hours. Make sure the battery you select is rated for at least, if not higher, the total ampere hours you calculated. The number of hours of sunlight you receive depends on the time of year, as well as the location and position of the solar panel. 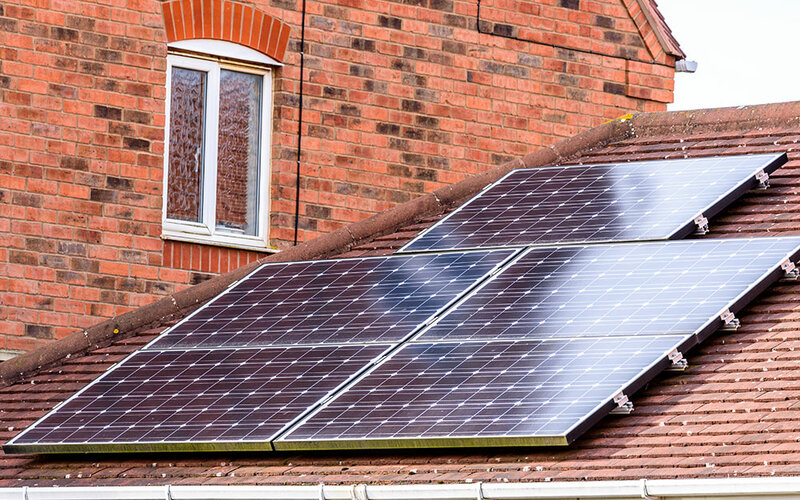 Most solar panels typically receive at least four hours of sunlight a day, but this can be adjusted if you know the specifics of your environment. This gives you the wattage for the solar panel that will work best for you. In this example, you should look for 120-watt solar panel. Solar panels are the key to solar power. They are made up of photovoltaic cells that absorb the sun’s energy and convert it to electrical current. The three most popular types are polycrystalline, monocrystaline and amorphous. Solar panels only generate power during daylight hours, and they do not store electricity. Off-grid power systems require deep-cell storage batteries to store the power for future use. The power stored in batteries can be called upon when the solar panels are not generating power. Polycrystalline panels are made from a block of silicon with many different crystals. They are rigid, efficient and work great in areas with high levels of sun exposure. Monocrystaline panels are made of one silicon crystal. They are more expensive but also more efficient. Amourphous panels, also called thin-film panels, are flexible and easier to work with than the others. They work in all daylight conditions, making them ideal for areas with lower sun exposure. Charge controllers, also known as charge regulators, regulate the voltage going into the battery and protect battery discharge at night. They also protect the battery as it can be damaged by the fluctuating charge if a panel is connected directly to it. A power inverter converts DC power from the batteries to AC power, which is the common electricity found in homes. Inverters come in two types: modified sine wave and pure sine wave inverters. Pure sine wave power is the same power provided by utility companies, so everything in your home will function the same as it would under grid power. Modified inverters are less expensive than pure inverters. Most home appliances will run using a modified inverter, but some common equipment should not run from a modified unit, such as laser printers, amplifiers, fans and CFL lights. DC disconnects are essential in a grid-tied system but not needed in an off-grid system. The DC switch is installed near the point where the solar panel power enters the house. The switch turns off the power connection to the panels so you can safely work on them. Batteries or a bank of batteries are required to store the power the panels create. Deep cycle batteries are designed to be discharged and recharged hundreds of times, making them compatible for use with solar panels.